Prototype: 3 different German Federal Railroad (DB) "Silberling" / "Silver Coins" design commuter cars. One type Bnb 719 car, 2nd class, one type ABnb 703 car, 1st/2nd class, and one type BDnf 735 cab control car, 2nd class, with a baggage area and a "Karlsruhe" design end. Model: The minimum radius for operation is 360 mm / 14-3/16". The cars have underbodies specific to the car types. The trucks have brake shoes. The cars have factory-installed LED interior lighting. They also have operating current-conducting couplers. The 73409 marker lights can be installed on the cars. 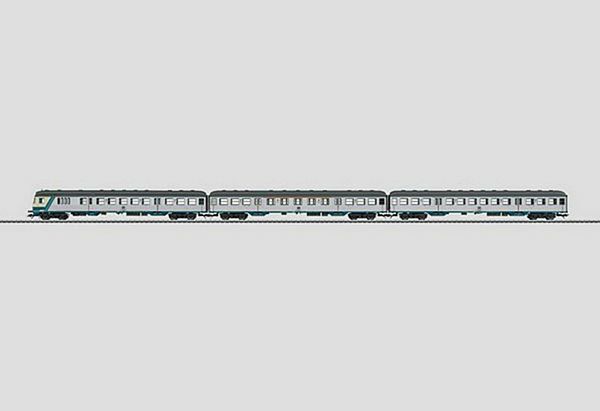 The cab control car has triple headlights and dual marker lights that change over with the direction of travel and that will work in digital and analog operation. Maintenance-free LEDs are used for the lighting. The cab control car has a drag-switch. Total length over the buffers 84.6 cm / 33-5/16".